@Poondaedalin This has to be this card's flavor text. Lunara used Vine Whip! It's super effective! Magma Rager fainted. @toothlessmon Oh no, Malygos sticking around a turn is good. This is definitely a new issue. Malygos kinda breaks this card, although I do like your idea because it adds some ability to play around it by putting a high health minion on the left. Compare this to consecrate and it seems a bit too weak. 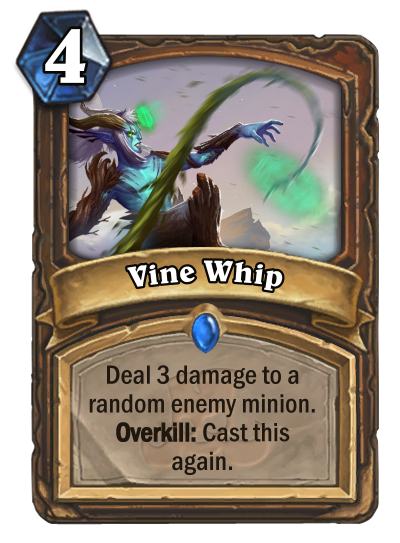 I think the best balance change would be to allow you to target an enemy minion with the first whip, and make the overkill effect random. That way the card would be a slightly stronger version of an already weak card, Multi-Shot. So in best scenario, where opponent has board full of 2health minions, its 4-mana deal 2 to all enemy minions. If he have at least one 3health minion, most likely you will cast it only few times (or even one). I don't know, it doesn't sound good enough. If you compare it to storm or hellfire (yea I know hellfire damage your minions). IMHO you should make it stronger. Make it like not random, but from left-to-right, so you can control effect with some trading. Also it would made it more interesting.